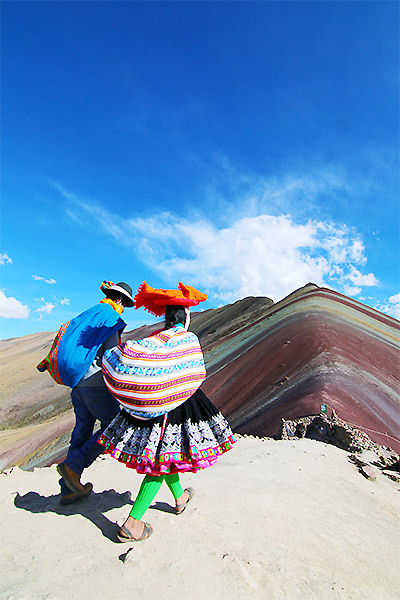 Vinicunca Mountain Vinicunca Trek Pricing: From $340 USD per person, for groups of 4 or more trekkers. Please contact us for pricing for smaller group treks. We also offer a longer 4D/3N Rainbow Mountain Ausangate Trek, which includes two additional days to explore beautiful Ausangate! 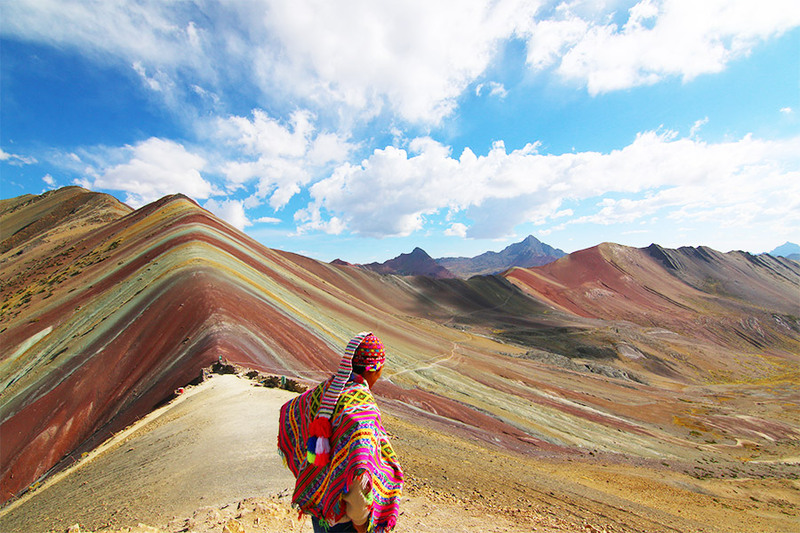 Trek through some of Peru’s most beautiful scenery to visit the world-famous Rainbow Mountain! On this 2 day/1 night trek, you will hike through sloping meadows surrounded by sky-scraping mountains before camping at the base of Rainbow Mountain. By opting for the 2-day trek, you will be able to ascend Rainbow Mountain and visit the peak in complete solitude- before any other trekkers arrive. 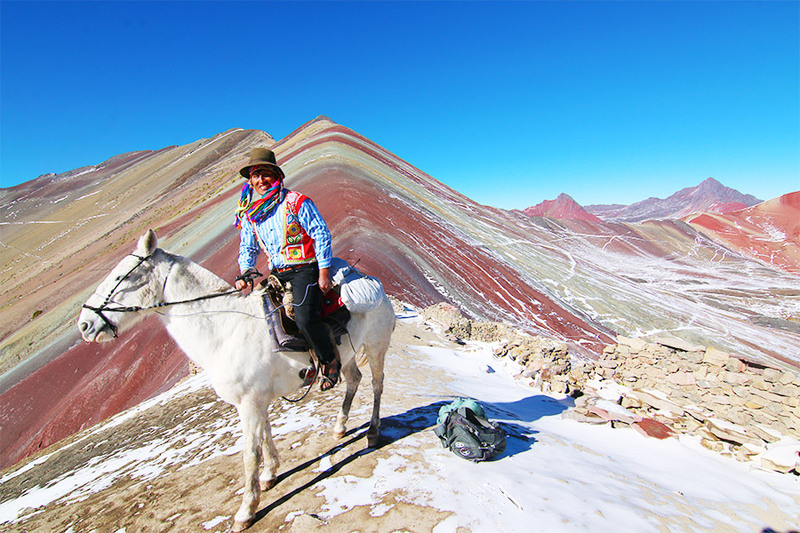 In addition, we follow a unique route that allows for a more remote experience and avoids the environmental damage associated with standard Rainbow Mountain day tours. This is an adventurous overnight trip, with comfort camping under the starry skies of the southern hemisphere. We’ll visit remote villages and share the trail with curious alpacas along the way! Early morning departure for the province of Quispicanchis, home to magnificent Ausangate, the Rainbow Mountain of Peru, and countless other natural wonders. Along the way we`ll stop at two beautifully restored colonial churches and scenic lookouts. We’ll arrive at our trek departure point midday, and break for a tasty picnic lunch before setting out for our campsite for the night, Illapampa. After a hearty breakfast set out on for Peru’s Mountian! Ascend through dark red mountains, with views of snowy peaks in the close distance. After 1.5-2 hours we’ll arrive at Vinicunca pass, directly facing the colorful mountain. Enjoy time to explore on your own, take photos and enjoy incredible views of the Vinicunca Mountain, Ausangate, and multiple other peaks that dominate the area. After a break for lunch, we’ll begin the return hike, arriving at your Cusco hotel in the early evening. All required equipment except sleeping bag. Add a stargazing, astro-photography and Inca astronomy tour. $39 USD per person. -15C sleeping bag with fleece liner and hot water bottle- $20 USD each. 1 Pair Trekking Poles- $20 USD each. Additional Riding Horse- $69 each. One emergency riding horse per 5 trekkers included in trek price. Comfort Camping Upgrade- $76 USD per person. Includes -15C sleeping bag with fleece liner, hot water bottle, a pair of trekking poles, larger tent with solar lantern, extra thick air mattress, and wine served with dinner each night. 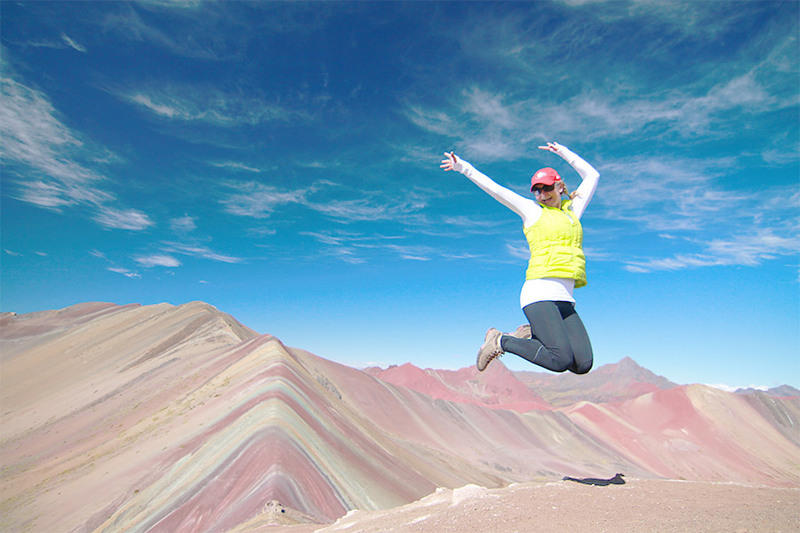 Vinicunca Mountain Tour and Ausangate treks do not include a final day at Machu Picchu. However, Ayni offers several Machu Picchu extensions that can be added either before or after your trek. Our Machu Picchu Luxury Tour is an excellent way to relax in comfort after a beautiful yet challenging multi-day trek. The Machu Picchu with Homestay extension combines authentic, off the beaten path experiences along with a visit to Peru’s wonder of the world. The Express Machu Picchu and Sacred Valley extension fits all the highlights of the area in a few quick days. 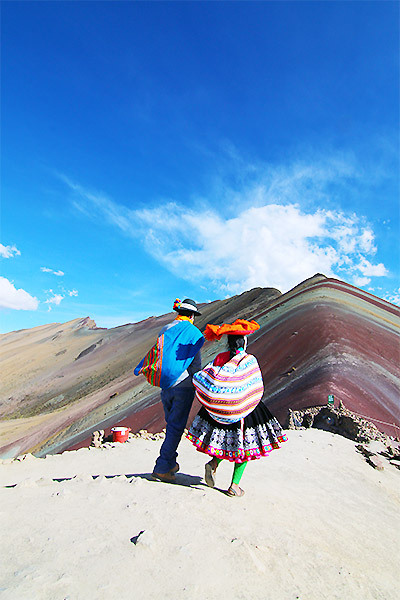 Before 2015, the breathtaking Rainbow Mountains of Peru, also known as Vinicunca Mountain, were relatively unknown among tourists. 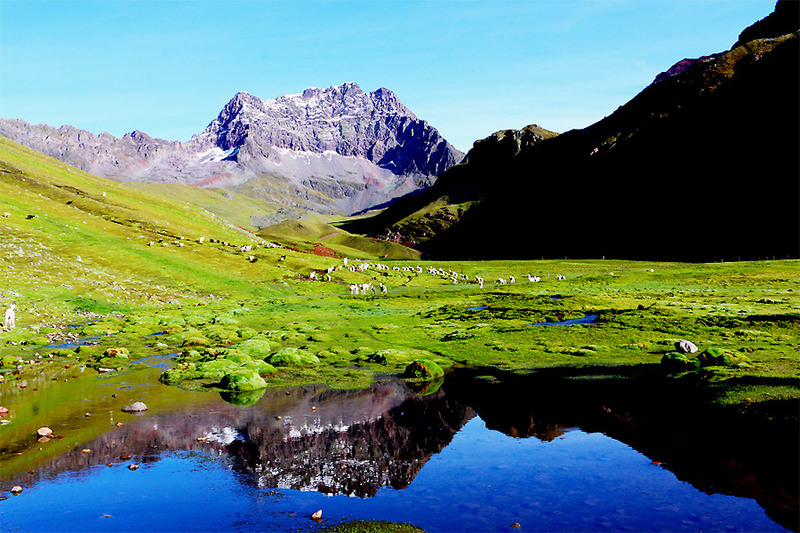 However, due to its unique segmented stripes of bright colors, the mountain has recently gained increasing popularity and has become one of Peru’s must-see destinations. Only three hours from Cusco but still relatively unmarred by the traveler, Vinicunca Mountain Peru is truly a unique sight to behold: colorful washes of yellow, blue, and maroon cascade down the sides of the mountain like waterfalls, while the vibrant sky and soft white clouds graze the peaks. Your trek will begin bright and early as you depart Cusco for the Quispicanchis province (about a 3-3.5 hour drive). Quispicanchis is known for its incredible landscapes- including the breathtaking Ausangate rainbow mountain range. You will arrive at the departure point mid-day. The hike will begin with a moderate ascent, and you will hike through sloping meadows surrounded by sky-scraping mountains. Along the way, you will likely see fields of grazing alpacas and llamas, and if you’re lucky, a fox or chinchilla. An approximately two-hour hike will take you to Illapampa, your campsite for the night. You will camp near the home of a traditional alpaca farming family and will have the opportunity to speak to them about their lifestyle and culture. After a delicious dinner prepared at the campsite, you will settle into your tent for the night. Don’t forget to take a moment to appreciate the beautifully clear and starry sky! On the second day, you will begin the ascent to Vinicunca Mountain. As you climb, you will notice the mountains becoming darker and more colorful, and you will have a view of stunning Ausangate Rainbow Mountain in the distance. After an approximately 2 hour hike through Vinicunca Pass, you will arrive at your destination: the incredible Colorful Mountain! Here, you will have time to explore, take photos, and enjoy not just Mountain, but also breathtaking panoramic views of the entire valley. You will then hike back to your starting point (approximately 3-4 hours), where you will enjoy a hearty lunch before returning back to Cusco. No trip to Peru is complete without a visit to these incredible mountains- book today! Rainbow Mountain is one of the highest elevation treks in Cusco, so it is HIGHLY recommended that you spend a minimum of two days in Cusco (or another high elevation city) to become acclimated before attempting the trip. Like many treks in Peru, the weather along the route is subject to sudden changes, so be prepared for warm days and cold nights- especially while at high altitudes. Nights can be as cold as 10-15° Fahrenheit, so don’t forget warm clothes, hats, and gloves! The best time to trek is usually between June and August. This is Peru’s winter, and is known as the dry season. Trek conditions vary greatly depending on the weather, and while you can trek year-round, dry conditions are usually preferred.